Cruisers having fun...Carnival in Trinidad there was a party like no other celebrated throughout the Caribbean. 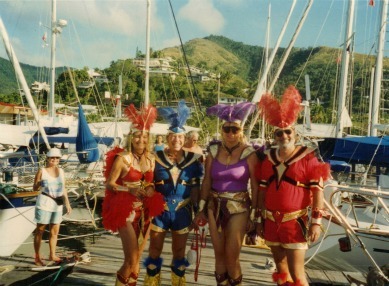 Here are some fellow cruising sailors in their costumes prior to J'ouvert in Trinidad...Trinidad was one of the few places that we lived on the dock...Trinidad has limited places to anchor out... Scotland Bay, comes to mind as well as TTYA... this picture was taken at Trinidad and Tobago Yacht club (TTYC)...our home and we were in Trinidad. For more information, including some beautiful pictures of Trinidad, go to the official website. Although jouvert in Trinidad is quite a party, do not plan on getting any boat work done , from Christmas until fat Tuesday... the official day to celebrate Jouvert. 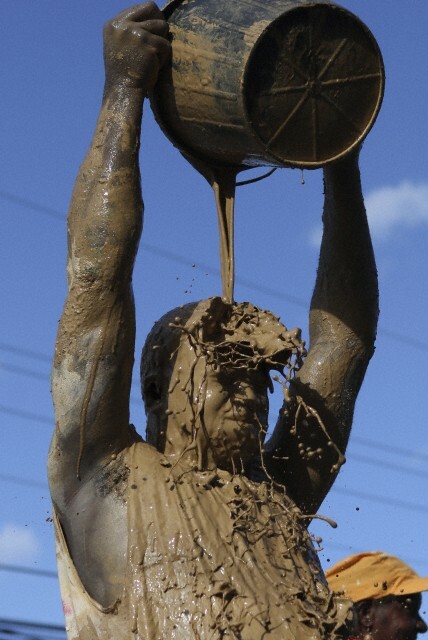 The Trinis, what the natives call themselves, put party time ahead of work priorities for these two months. The large companies would sponsor steel bands for competitions in this period, some of the larger bands would have over 100 performers... when we were there the Amoco Renegades, were one of the top bands. It is hard to describe the parade through downtown Port-of-Spain the night before Carnival, in February... it starts at about 2 AM and goes on in till well after daybreak. You join a party club, you can spend a lot of money on costumes like the above... or do as we did and spent $20 for a "costume"...it wasn't much... each party club had three trucks...which you followed, a soundtruck, a truck dispensing beer and rum, and followed by a mud truck... the parade route wandered through downtown Port of Spain, Trinidad. We had an absolute ball, and never saw a fight or any situation that made you feel uncomfortable... did I say that the Trinis like to party? I have experienced five Mardi Gras in New Orleans, and with all due respect to the Crescent City, there is nothing like a Carnival in Trinidad. 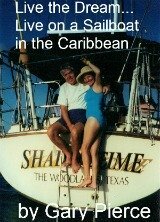 This is all part of the sailboat cruising lifestyle in the Caribbean. Thanks for reading, Jouvert in Trinidad...a fun time for the sailboat cruiser in the Caribbean.